When you hear the word carnival, what do you think of? We’re assuming that your imagination just kicked into overdrive and is now flooded with different smells, sounds, and sights. Of course you’re imagining the irresistible scent of hot dogs and funnel cakes, clowns juggling for the amusement of the children, and last but certainly not least, the unmistakable screams of glee in the background as attendees enjoy the thrill that comes with the rides. We believe that excitement is a requirement for a carnival, and that’s why have a vast selection of carnival rides for you to choose from. Whether for the young, or the young at heart, we’ve got a ride guaranteed to put a smile on your face. In this blog, we’re going to highlight just a few of the most popular mechanical and inflatable rides that we offer. Sorry adults, this one is for the kiddos! Our Go-Gator Coaster lets children from the ages of three to ten rise, dip, and turn on the back of a colorful and friendly gator! It is easily a favorite amongst the young ones, and is able to fit twelve children at a time for the ride! The G-Force is a great ride for children and adults alike. 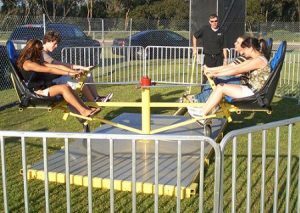 With four people strapped, the riders are able to control the speed of the ride. The faint of heart are able to pump slowly for a leisurely cycle, while the thrill seekers can pump as fast as their arms will let them for an exhilarating and literally breathtaking ride. Setup only takes up to 30 minutes and has always been a favorite at the carnivals that we throw. With the intense heat of the Florida summer, nothing feels better than sending yourself down a water slide. We know this is what people want from a carnival on a hot day, so we provide an array of water slides for all ages. Our Dash N Splash is ideal for children aged three to nine, while our Kong Krazy Triple Lane Slide will provide the excitement that adults are looking for. Be sure to browse all of our water slides to find the perfect one for your event! While we are proud of each and every one of the carnivals rides that we offer, we consider our Ferris Wheel to be our prized possession. In fact, it’s the only 50-foot Ferris Wheel in South Florida! 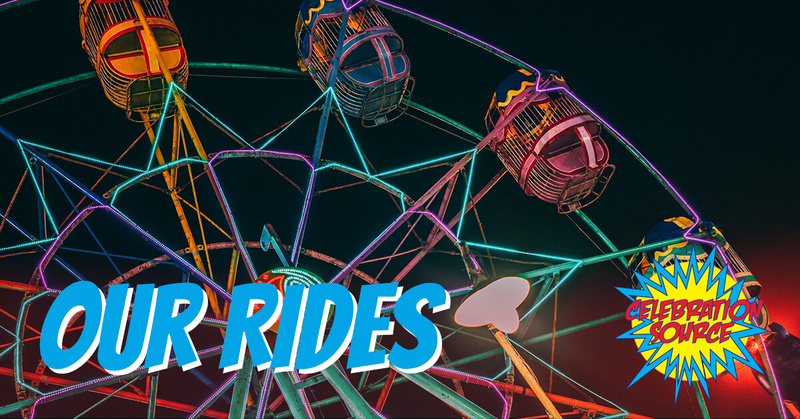 A classic for first dates, or just to bring the kids up for a great view of South Florida, this ride has always been a favorite for children and adults and is guaranteed to wow your carnival goers. At Celebration Source, we’re proud to be your one-stop-shop for all of your carnival and party entertainment needs in Delray Beach! We are dedicated to providing you with an event that’s truly spectacular for people of all ages. If you’re looking to throw the event of the year, be sure to contact us now for a free quote!